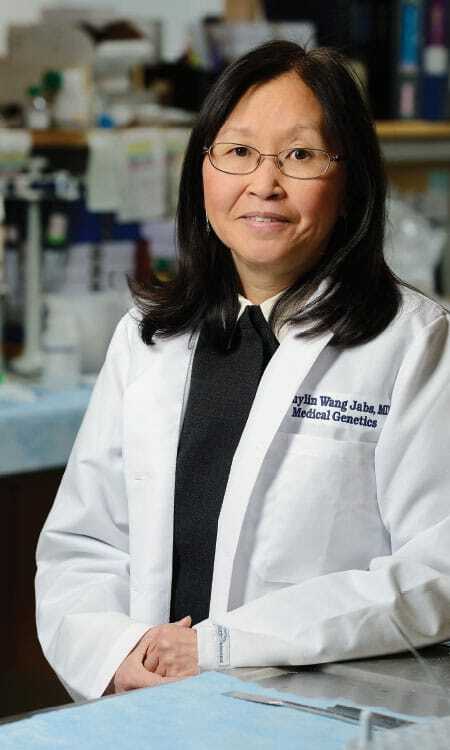 Ethylin Wang Jabs combines laboratory research with clinical practice at Mount Sinai Health Systems in New York. Through tens of thousands of hours in the lab, Jabs has helped identify the genetic variants that are responsible for a number of rare craniofacial disorders. She and her colleagues have spotted the genes that underlie oculodentodigital dysplasia (a syndrome characterized by small teeth, small eyes, and a fusion of the fourth and fifth fingers); Miller syndrome (a condition marked by sunken cheeks, an underdeveloped lower jaw, and often a cleft palate); and keratitis-ichthyosis-deafness syndrome. Her studies have pointed the way toward new avenues for prevention and treatment—and they have also shed light on fundamental molecular pathways that govern embryonic development. Since 2007, Jabs has pursued this work at the Mount Sinai Health Systems in New York, where she is a professor of genetics and genomic sciences. Before then, however, she had spent her entire career at Johns Hopkins. Indeed, she was steeped in the culture of Hopkins from early childhood. Her father, Shih Yi Wang, was a professor of photochemistry at Hopkins’ School of Public Health. Jabs entered Hopkins in the fall of 1970, as part of the first class that included women. Jabs initially planned to major in mathematics but soon found her interest turning toward medicine. At the end of her sophomore year, she was accepted into what was then known as the two-and-five system, which allowed students to earn a bachelor’s and then a medical degree (from the School of Medicine) within a single seven-year program. Somewhat to her surprise, Jabs discovered that she loved the daily rhythm of clinical work: getting to know patients, comforting family members, explaining complex medical conditions in plain language. At the same time, however, she found that she loved doing basic science in genetics laboratories. After completing her residency in pediatrics at Johns Hopkins Hospital, she did a fellowship in the laboratory of Barbara R. Migeon, a pioneering medical geneticist who has taught at Hopkins since 1962. By the end of her fellowship, Jabs found a way to marry her laboratory work with her love of the clinic: She decided to work with children with craniosynostosis, cleft palate, and other craniofacial disorders. Those syndromes sometimes have environmental causes related to fetal exposures to toxins, but many of them are caused by discrete, rare mutations. “I loved working with those patients,” she says. “I slowly collected a biobank of DNA samples, and once that was in place, we were able to isolate a number of genes.” By the mid-1990s, Jabs had become one of the most prominent scholars in the field, and the Hopkins Center for Craniofacial Development and Disorders had become one of the best-known treatment sites. Today in New York, Jabs is as busy as ever. Her lab at Mount Sinai is collaborating with researchers at the National Institutes of Health on genetic studies of Moebius syndrome, a rare condition in which infants are born with no ability to move their facial muscles. She is also doing studies on mice to assess the potential of certain drug compounds to prevent and treat craniofacial disorders. Jabs is married to Douglas Jabs, an ophthalmologist whom she met when both were medical students at Hopkins. Their daughter, Alexandra Jabs ’11, is now a student at the Bloomberg School of Public Health, where her grandfather once taught.